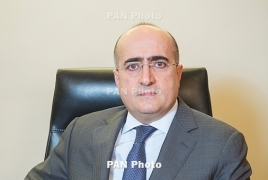 PanARMENIAN.Net - Andrew Mkrtchyan, Chairman of the Board of Directors at Ameriabank elaborated in an interview on the future of Armenian banking system and possible developments for 2016, tackling questions on the crisis in the system, Ameriabank's recent collaboration with international financial institutions and much more. The interview was triggered by the two deals signed by Ameriabank with major IFIs: the European Bank for Reconstruction and Development (EBRD) invested $40 million in the capital of Ameriabank, while the International Finance Corporation (IFC) provided a $50 million subordinated loan. Mr. Mkrtchyan, crisis is often viewed as an opportunity. How do you think does today's crisis bring about new opportunities? I would think twice before defining the current situation as crisis. It is, indeed, a very difficult period for Armenia’s economy, the region and the world in general. This kind of situations mobilize both business entities and individuals, making them look at circumstances critically, go over the status quo, sometimes abandoning ideas that are not of great importance, and make difficult decisions, which had been repeatedly put off previously. This is really a window of opportunities for “purging”, discarding what we don’t need, raising efficiency, restructuring the company to be able to respond to challenges more adequately. Moreover, this is also a new opportunity for businesses to increase their market share in a proactive, aggressive manner and explore certain new niches. There is a higher probability of upcoming mergers and acquisitions, for in difficult times companies with ineffective or problematic management structures, unable to withstand all the challenges, become as a result more flexible in making difficult and strategically important decisions. Is this period of economic and political uncertainty the right time to ink deals with EBRD and IFC? I really do not think the situation is unpredictable. From an economic viewpoint, it is predictably difficult. From the political one, well, there is no quiet season or a relatively predictable year, especially given the problematic geopolitical region we live in. As for EBRD and IFC deals, we did not sign them in order to gain stability – we are already one of the most stable banks. These deals enable developing our business both organically and non-organically. We are going to use the funds both for merger and acquisition deals, also aiming to attract additional resources. In the long run, these investments will help us prepare for IPO. Ameriabank’s assets have now topped $1 billion, an unprecedented result for Armenia, with the EBRD and IFC deals unveiling opportunities for further growth. What business development plans do you have from this point of view? I believe crossing $1 billion is a landmark achievement. For the first time in 25 years of independence, an Armenian bank demonstrates such indicators. This is very symbolic and important for us. Having signed the deals with EBRD and IFC, Ameriabank doubled its statutory capital, gaining new growth opportunities firstly because we can now provide loans to major corporate projects – something that no Armenian bank could have done on its own before. In the coming years, we will be able to double our assets. As I have already mentioned, non-organic growth continues to be a priority for us, and hopefully, due to the increase in capital, we will sign merger and acquisition deals this year and thus increase our capital even more. Our ambitions and aspirations towards the forthcoming IPO are another step, an important one. You need to understand it is the size of a company that matters to many institutional investors worldwide, regardless of their attitude towards the country or region. The size of the bank also matters for gaining wider access to international financial markets. We have always been actively collaborating with IFIs and are now an IFI fundraising leader on the local market. So far, IFIs have invested about $500 mln in Ameriabank; many global players have opened completely collateral-free lines of credit for us. By the way, we are the first Armenian bank to work with European and American banks without any collateral. I would like to stress, that the fact of provision of hundreds of millions of dollars-worth credit lines without any security is an evidence of trust towards our bank and indeed a mark of excellence. From all the existing problems, which do you think influence the Armenian banking sector the most? How do you feel about the consolidation process in the market? Currently, the main problem of Armenian banks is the quality of loan portfolio. Unfortunately, in difficult times we cannot avoid declining loan portfolio quality. No matter what we say about Armenia not being strongly integrated in global economy, we are nevertheless part of this globalized and interconnected world. Hence, it is quite obvious that falling oil prices, devaluated ruble have resulted in many Armenian exporters being unable to gain any substantial profit from their activity or effectively organize the export of their goods to Russia and CIS. Naturally, the exporters' problems affect the quality of banks’ assets. Significant challenges emerge on the way to preventing this quality deterioration. In addition, decline in private remittances by more than a third has actually “drained up” local demand and financial potential, while substantial decline of copper and gold prices had a second wave effect here. In the event of increasing provisions for loan losses and write-offs of bad debts, the capital adequacy ratio will decrease. Actually, capital adequacy ratios of Armenian banks during the recent years have already been low, with this problem threatening to interfere the process of attracting new capital and investors. Therefore, in the second half of the year, given toughening of minimum statutory capital requirements by the Central Bank of Armenia, consolidation processes will gain further dynamics. We will witness merger and acquisition deals, with certain players forced to leave the market. As for my attitude towards consolidation, well, I think for a country with a size and GDP like ours, 10 is the best number for banks. Our economy being rather concentrated, small banks are unable to adequately meet the needs and challenges of the sector. The first couple of players in almost every industrial sector are bigger than any Armenian bank. No bank is able to serve such big clients on its own, and bank pools or syndicates in our economy cannot be formed, given the difficulties with division of collateral security and financial flows. What development trends do you expect for the Armenian banking system this year? Currently banks are actively negotiating on merger and acquisition deals. I expect 2016 to be a year of rehabilitation, cleansing of banking system; banks will merge, consolidate and eventually start a new development stage. All banks will choose to focus on retail banking and small and medium enterprises as less risky sectors. On the whole, I think we just need to get accustomed to the idea that global and regional processes directly influence our economy. We are part of a global system, so no matter whether it’s a problem in China or increase of the Federal Reserve rate in the U.S. or devaluation of the Russian ruble, it will inevitably affect our economy. Therefore, we need to build our model, remembering that the whole global economy is cycle-based, so that we can adequately manage risks during ups and downs. At the same time, we are very positive about the future. We believe in the growth potential of Armenian economy, or else we wouldn’t have invested our resources and made long-term plans. When you are evaluating the situation in the long-term perspective, you can see that you just have to overcome certain periods. We set out in 2008, at the very peak of the crisis. If we had been pessimistic and had not planned for years ahead, we wouldn’t be where we are today. Hence, you always need to look into future with optimism and adequately respond to challenges you are going to face.